Taco Wagon Success | Shafer...Power! Welcome to AdVentures. In this series, we’ll take a closer look at our family’s entrepreneurial venture of the month. We’ve already hosted a thrift sale, a coffee stand and made and sold homemade chocolate bars. 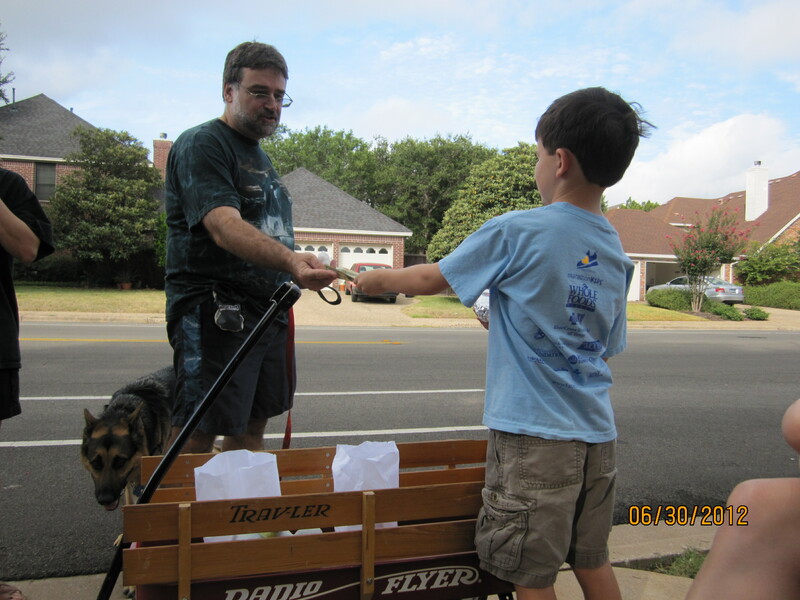 For June’s event, which was inspired by Torchy, we sold tacos using our children’s wagon. As with all AdVentures, the goal is to have some fun with the kids and learn more about entrepreneurism. Our biggest challenge, however, is living in a neighborhood that’s fifteen minutes from the nearest taco joint. Since most of our neighbors probably feel the same way, we thought offering tacos would be a great AdVenture for the month of June. In other words, we believed it would be a great idea to sell breakfast tacos in our subdivision…just a short walk from many people’s homes. 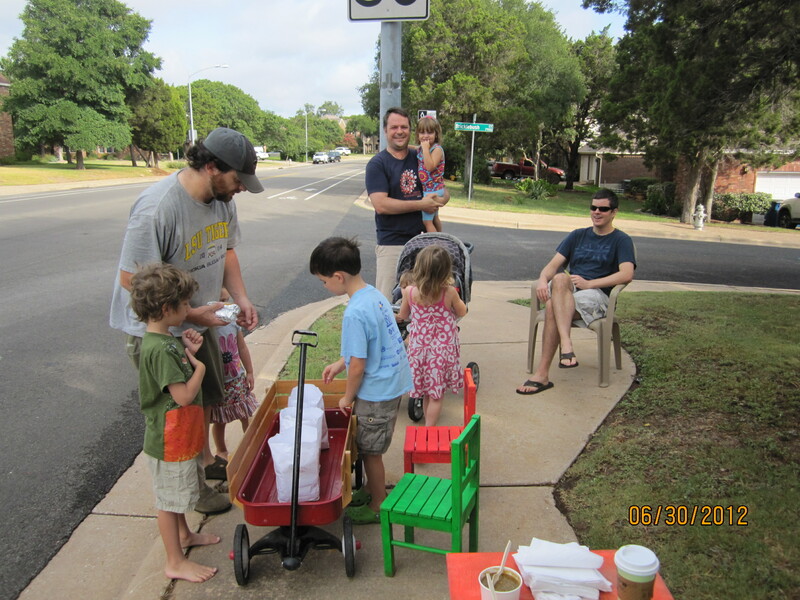 As a result, we partnered with Torchy’s and hosted a taco wagon Saturday morning on a corner near our house. And thanks to some flyers we handed out the evening before – and a little word of mouth advertising – the event was a smashing success. I should note it took every. last. ounce of my willpower to go straight home rather than pulling over and ransacking that bag of goodies. Once we arrived home, we quickly loaded up the wagon and headed to the corner to the let the fun begin. The kids sold all thirty tacos during the hour we were open and made just over $50. All of the customers except one heard about us from the flyers we handed out or through word of mouth. (One customer was out exercising and stopped back when he was done.) The gentleman in the bottom picture indicated our flyer attracted two separate parties from his house (his son visited us earlier in the morning). He told the kids that advertising works, which left big smiles on their faces. Rather than give my impression of how the event went, I decided to ask their kids. Dad: What did you guys think of the taco wagon? Dad: Good?!? What does good mean? Owen: That means we like it. Dad: Ok, so what did you learn from the taco wagon? Owen: You have to be patient. Dad: What do you mean by patient? Owen: When nobody shows up, you have to be patient because people will eventually show up. Dad: Why did customers eventually show up? Owen: Because we handed out flyers. Dad: Did you think the taco wagon was fun? Owen & Malia (together): Yes! Dad: What was fun about it? Malia: Lots of people visited us. Owen: The fun part was having our friends visit us at the stand. Dad: What do you plan to do with the money you made? Owen: We bought some popcorn at the movies. And we’re also going to give some of the money to the poor people who need it. Dad: I think that’s a great idea. What entrepreneurial AdVenture should we do next? Dad: What’s your favorite thing about doing these AdVentures? Malia: It’s fun and you get to ride in the wagon once you’re done. Owen: We get to have fun and I’m happy when customers visit us. Do you think our kids are learning from these events? Is there anything you would change in our approach? What entrepreneurial event do you think we should do next? I love this post. This activity really met a demand in your area(which is actually somewhat isolated), from the convenience of the Central Texas mainstay of the breakfast/early lunch tacos. I like the way you seek feedback from the kids as well, and Owen’s comments related to having patience (knowing the customers would come) shows the education is taking root for him. Thanks Dave. I’ve found that questioning them after the event requires another level of thinking. It’s also a good way to reiterate the key messages. Congrats on the successful event. It seems like Owen is definitely getting the hang of it. Thank you Lloyd. My wife pointed out that if they’re having fun, they’re much more likely to learn from the situation. It seems to be working. What a fun and rewarding way to learn about being an entrepreneur. And yes, they are definitely learning something new! Thank you Ellen for the kind note! 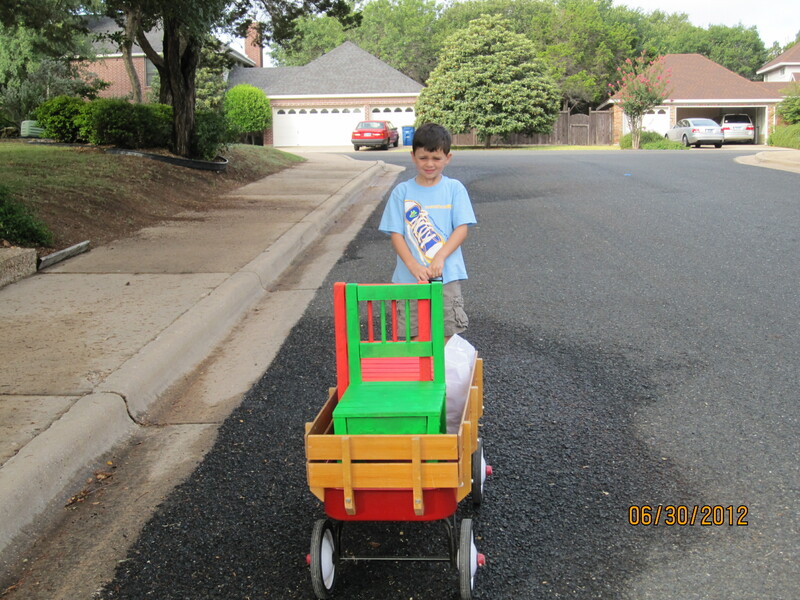 Selling Torchy’s tacos from a Radio Flyer wagon…how do I invest in this business?